It was April 1777, one year after the Declaration of Independence was signed. Sybil Ludington had just turned sixteen. She desperately wanted to do more to help her brand new country defeat the British. Already she was spinning wool so her family didn’t have to buy cotton goods from the British. For the same reason she wouldn’t drink tea. But being young and a girl, what more could she do? Then, on the night of April 22nd, the British attacked Danbury Connecticut, where badly needed supplies for the Continental army were stored. 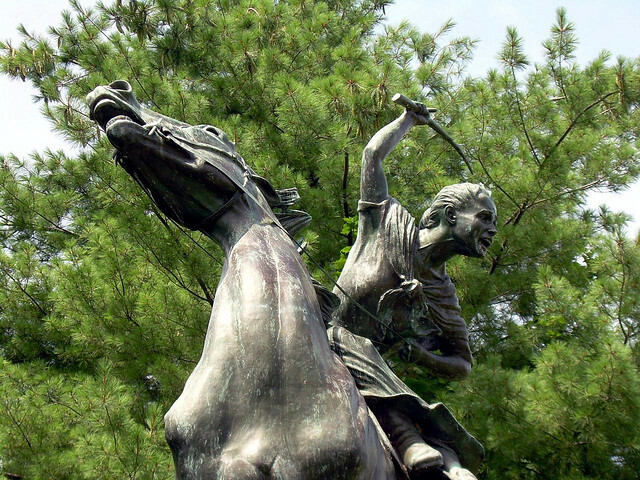 A rider was sent out at a full gallop to notify Sybil’s father, a colonel so that he could bring his community’s men to defend the supplies against the British. The problem was… all of the colonel’s men were asleep in their homes where they had gone for the spring planting. Someone who knew where they lived had to spread the alarm. Sybil saw her opportunity to serve her country. She saddled her horse and set off into the dark, rainy night. The muddy trails would have made for a dangerous ride even during daylight for any man, but Sybil went from farm to farm throughout the stormy night. At one point, one of the men offered to ride with her, but she refused his offer, instead insisting that he ride out in another direction to inform even more of the farmers. When Sybil completed the circuit and returned home she found all of the men she had warned, nearly a regiment*, gathered at her father’s mill ready to ride to the defense of Danbury. While they arrived too late to save Danbury from burning, they joined General Wooster’s men to drive the British back to the sea. While most Americans know of the famous ride of Paul Revere to warn that the British were coming, his fame was cemented into history by Henry Wadsworth Longfellow, who penned the famous poem, “The Midnight Ride of Paul Revere.” Sybil Ludington needs a good publicist, too. Finally in 1961, a large, exciting bronze statue was created by Anna Hyatt Huntington. It, along with an engraved plaque, secure Sybil’s Stormy, All-Night Ride into history.